The Rogel gift “will be foundational to continue our commitment to both discovery science and clinical research,” says Marschall S. Runge, M.D., Ph.D., dean of the Medical School; executive vice president for medical affairs; and CEO of Michigan Medicine. “Basic science is the very early stage research that leads to a deeper understanding of cancer, and the translation of bench-to-bedside applications is ultimately how we develop new treatments and therapies that will help our patients.” New research will build on a strong foundation of cancer discoveries at U-M, some of which are highlighted here. Arul Chinnaiyan (M.D. and Ph.D. 1999), the S.P. Hicks Endowed Professor of Pathology and director of the Michigan Center for Translational Pathology, and a team of researchers found that half of all prostate cancer tumors harbor a genetic anomaly in which the genes TMPRSS2 and ERG fuse together, acting as an on-switch for cancer development. This discovery has proved vital in directing new treatments for patients with prostate cancer. Kathleen Cho, M.D., the Peter A. 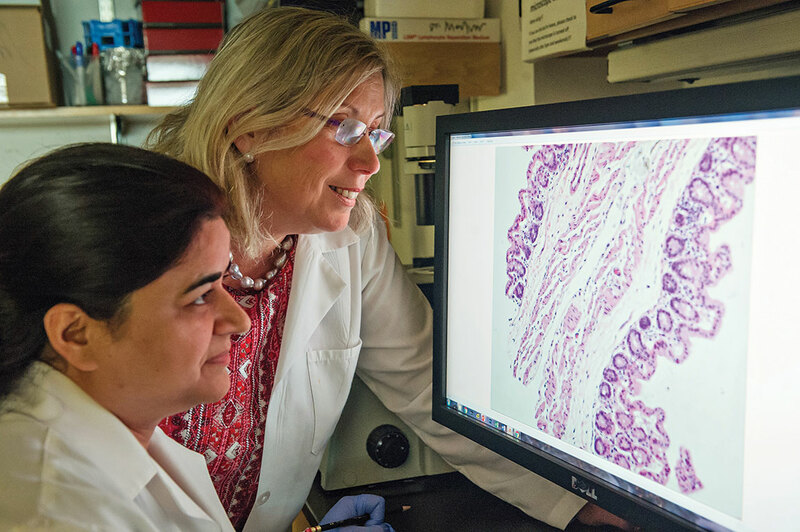 Ward Professor of Pathology and co-leader of the Rogel Cancer Center Cancer Genetics Program, and her team are creating novel mouse models of colorectal and ovarian cancers to determine key aspects of human disease, and to provide valuable tools for preclinical studies directed at improving the control and treatment of cancer. Daniel F. Hayes, M.D., the Stuart B. Padnos Professor of Breast Cancer Research, studies how circulating tumor cells in a patient’s blood are directly tied to that patient’s outcome. His lab is credited with making strides in breast cancer research that have led to multiple clinical trials and novel therapies. Both Reshma Jagsi, M.D., D.Phil., professor of radiation oncology and director of the Center for Bioethics and Social Sciences in Medicine; and Christine Veenstra, M.D. (Residency 2009), assistant professor of medical oncology, have looked at how cancer treatment affects employment and financial burdens. In separate studies, they have highlighted the importance of paid sick leave and the need to reduce the burden of cancer so patients can return to work. Jacqueline Jeruss, M.D., Ph.D., associate professor of surgery and director of the U-M Breast Care Center; and Lonnie Shea, Ph.D., the William and Valerie Hall Chair and professor of biomedical engineering, are exploring a new approach to fertility preservation involving isolated primary ovarian follicles. The research has the potential to expand options for young cancer patients undergoing treatments that may impact their future fertility. Elizabeth Lawlor, M.D., Ph.D., the Russell G. Adderley Professor of Pediatric Oncology, and her lab identified that cells in Ewing sarcoma — the second most common type of bone tumor in children and adolescents — have abnormal responses to stressful environments, which can induce relapses in patients who were previously in remission. Being able to understand the disease’s etiology has led to additional studies and better approaches to treatment. Ted Lawrence, M.D., Ph.D., chair and the Isadore Lampe Professor of Radiation Oncology, and his lab are researching how to better combine chemotherapy and radiation in order to improve the efficacy of cancer treatment. His team is looking at drugs that help sensitize the tumor to radiation treatment, making the one-two punch stronger and more effective than either treatment alone. This has been applied to particularly challenging cancers, such as those of the pancreas and liver. Allen Lichter (M.D. 1972), professor emeritus of radiation oncology and dean emeritus of the Medical School, was instrumental in the development and implementation of intensity-modulated radiation therapy, which better directs radiation during treatment and lessens side effects. Sofia Merajver (M.D. 1987, Residency 1991, Fellowship 1993), Ph.D. (pictured above), scientific director of the Breast Cancer Program and director of the Breast and Ovarian Cancer Risk Evaluation Program, and her lab teamed with the College of Engineering to create a tiny chip that makes it possible to isolate and study individual metastatic cells. The recently established Pediatric Brain Tumor Research Initiative has made Michigan Medicine a hub for studying diffuse intrinsic pontine glioma (DIPG), a highly aggressive and always-fatal type of pediatric brain cancer. Previously, DIPG tumors were only able to be biopsied posthumously, but researchers at the initiative, including Rajen Mody, MBBS (Fellowship 2000), professor of pediatric oncology, have begun to use intraoperative MRI to study them in children with new diagnoses. Carl Koschmann, M.D. (Fellowship 2014), assistant professor of pediatrics and communicable diseases, and his lab are exploring how genetic sequencing can be performed using spinal fluid, bypassing the need for open brain surgery altogether. Preliminary results from the initiative are impacting treatment plans and methodologies. The lab of Maria Castro, Ph.D., the R.C. Schneider Collegiate Professor of Neurosurgery; and Pedro Löwenstein, M.D., Ph.D., the Richard C. Schneider Collegiate Professor of Neurosurgery, is working to understand the pathogenesis of DIPG by generating spontaneous in vivo tumor models. Their work, which aims to demonstrate how certain mutations contribute to the progression of DIPG, has led to an FDA-approved gene therapy Phase 1 clinical trial, and may one day lead to improved prognoses for patients. Pavan Reddy, M.D. (Fellowship 2001), the Frances and Victor Ginsberg Professor of Hematology/Oncology and deputy director of the Rogel Cancer Center, and his lab focus on the role of cytokines and cellular effectors in graft-versus-host disease (GVHD). His research has yielded breakthroughs in the development of potential treatments for GVHD, a deadly complication of bone marrow transplants. Max Wicha, M.D., the Madeline and Sidney Forbes Professor of Oncology and founding director emeritus of the Rogel Cancer Center, was part of the team that identified stem cells in breast cancer — the first described in any human solid tumor — 15 years ago. Now, his lab is a leader in cancer stem cell biology, and it focuses on translating these research findings into clinical trials. Weiping Zou, M.D., Ph.D., the Charles B. de Nancrede Research Professor of Surgery, professor of pathology, and co-director of the Tumor Immunology and Transplantation Biology Program, and his team have made seminal advances into the regulation of cancer and immune cell interactions. The studies have allowed for the determination of clinically targeting immunosuppressive networks to effectively treat cancer patients. Read more about how philanthropy helps fill the gaps created by tight federal funding.